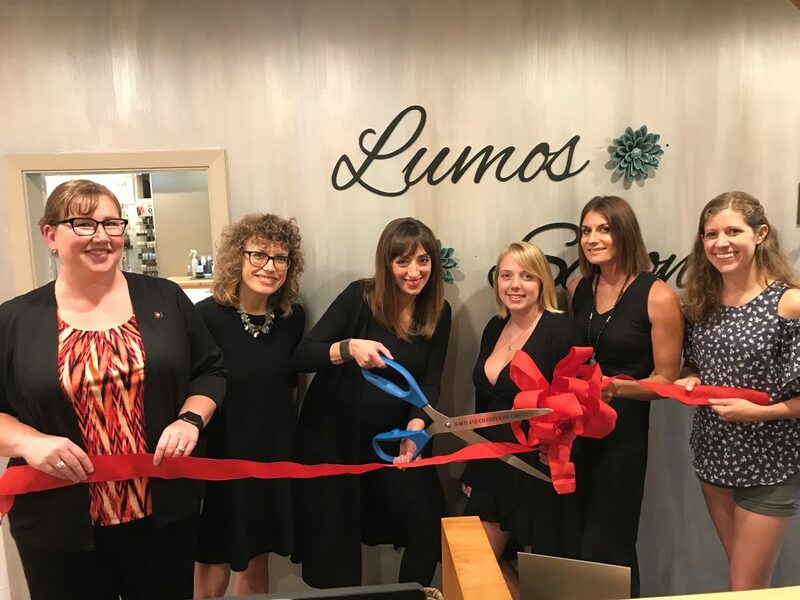 The Hartland Chamber of Commerce board of directors and ambassadors hosted a ribbon cutting ceremony on August 20, 2018 at Lumos Salon to celebrate their successful opening in Hartland. Owner Lisa Troemel is joined by Chamber representatives and employees as she officially cuts the ribbon. Pictured (l-r) are Chamber Ambassador/Board member, Karla Lauersdorf of Ixonia Bank; Lumos Salon employees Jackie Prata, Lisa, Jeri Vanderboom, Victoria Rechcygl; and Chamber Ambassador Dr. Kelly Newman of Generations Dental. Lumos Salon is an Aveda concept salon owned by Hartland’s own Lisa Troemel. She has been a part of the salon’s history for 19 years and has been the proud owner since 2012. Lumos is a twist on the Latin word lumen meaning, “bright”, “radiant”, or “light”. As they want to lighten up your hair, bring radiance to your skin, and brighten your day. Their mission is to provide excellent service with great products. They offer hair care, nail care, bridal services, waxing and makeup. Lumos Salon is located 151 E. Capitol Drive and can be reached at 262-367-0204. Visit www.lumossalon.com for more information.